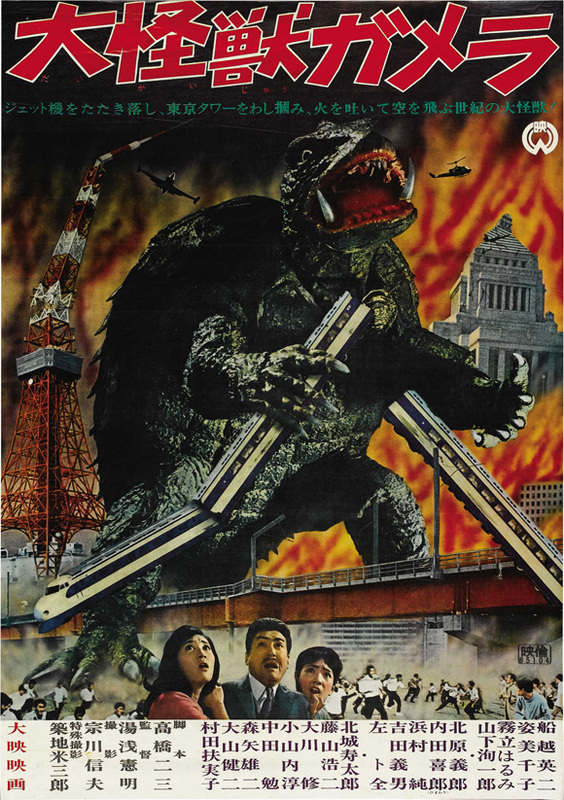 Gamera (大怪獣ガメラ Daikaijū Gamera) is the first film in Daiei Studio’s Gamera series. Known as ‘Giant Monster Gamera’ upon its original release in Japan, the film is also known as Gammera: The Invincible and Gamera: The Giant Monster. Ah, the first installment in the illustrious Gamera franchise. This movie is pretty lackluster, as it leaves the viewer feeling more like they just finished an old 1950s cheap B-movie flick. Pretty much, that’s what it is. A giant turtle is awakened and rises from an iceberg and goes on a rampage. This would not be my first suggestion if one wanted to get started on the Gamera movies, unless one was interested in the value of continuity, which is almost non-existent from movie to movie in this series. No, this movie is just a smash ‘em up monster movie which lacks an interesting story line, and boasts some eye-rolling Special Effects and generally stale characters. The main character, a small boy who idolizes turtles, is a patience-taxing character, as he appears no younger than ten but constantly acts no more than five; taking turtles to school, constantly whining about Gamera being a good guy, and carrying around bags full of rocks for Gamera’s “house”, even though Gamera is… a giant monster. Child actors of this nature would become a staple in this series of the franchise until its initial end in 1980. None of the other characters deliver anything spectacular, either, leaving the viewer not really caring about any of them. After a few futile attempts at defeating Gamera (which included the idea of dropping nukes on him), the military devises a plan, but it is so crazy that it just screams “Cheap B-movie!” There apparently is a giant capsule that is scheduled to be launched to Mars that is big enough to hold a giant monster. 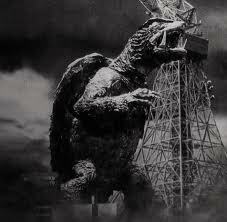 The plan succeeds and Gamera is launched into the cosmos, and peace resumes. 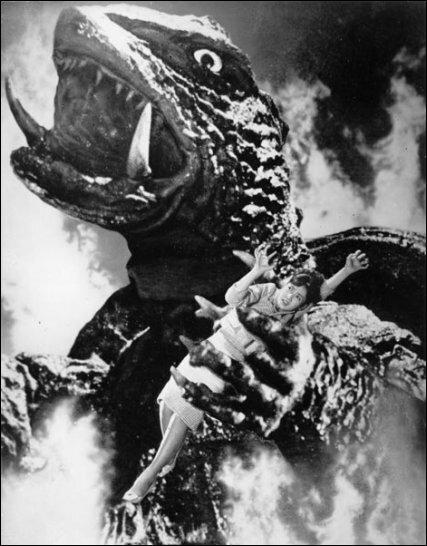 This movie did little more than introduce another giant monster into the genre, but they would become successful enough to make one every year from this point until 1971, and then one more in 1980, not counting the nineties and Millennium movies. Now I am a giant monster fan, and I will say that there are few monster flicks out there that don’t entertain me on some level. As for this one, I would say two and a half stars out of five is enough. Look familiar? … I know we’re making turtle soup of Gamera in this article – but trust me, he is popular for a reason! Gamera only gets better with time. For the most part. You know what… Watch the Heisei Trilogy, its awesome! Posted on September 1, 2011 0 By Jon D. B.	Daiei Movie Reviews! Posted in Daiei Movie Reviews!, Kaiju Movie Reviews!